I have never been able to get that excited about blush, but recently lots of them have caught my eye (the new one by Benefit and the Sleek blush packs to name just two). Here again is a run down on what I use and some before and after pictures to go with it. 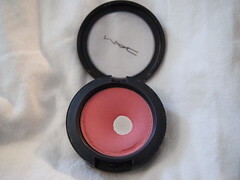 MAC Powder Blush (Pinch O'Peach) £17.50 - This is a warm peachy pinky colour. In my eyes its more of a dusty pink. It works well, very blendable and suits with lots of different looks. 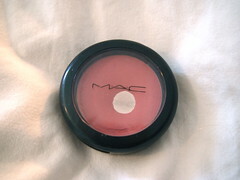 It's matte which I really like, if I want a little more shimmer then I normally just add a little highlighter to it. Again, not sure if you can see the difference but there you have it. If anyone has any recommendations for blushers I would love to hear them, need to get inspired! Ooo I might just have to check out that Soap and Glory one..I love their stuff. I have a hand cream of theres (such an old lady) that smells amazing. Thanks for the suggestion! Thanks for leaving comment on my blog, you look like a beauty in your pics!